Ruben Herrera leading chants with a bullhorn at an ICE protest in downtown Columbus. 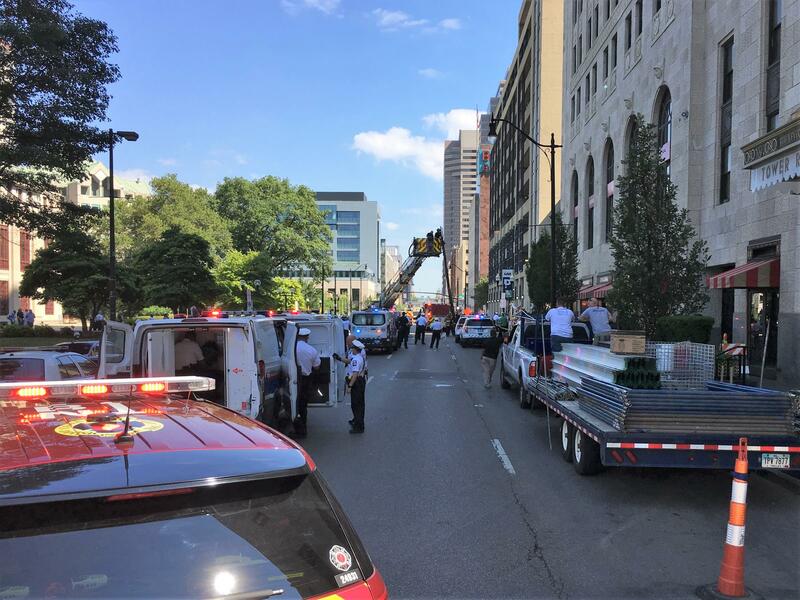 Scores of protesters constructed a two-story-tall tripod structure in downtown Columbus on Monday morning to protest U.S. Immigration and Customs Enforcement, blocking a major street in front of LeVeque Tower where the agency maintains a local office. One activist bound himself to the base of the tripod, which declared "ICE Ruins Lives Here," while another hung suspended from the top. The demonstration was eventually broken up by Columbus Police, who arrested about a dozen people, a spokesperson said. 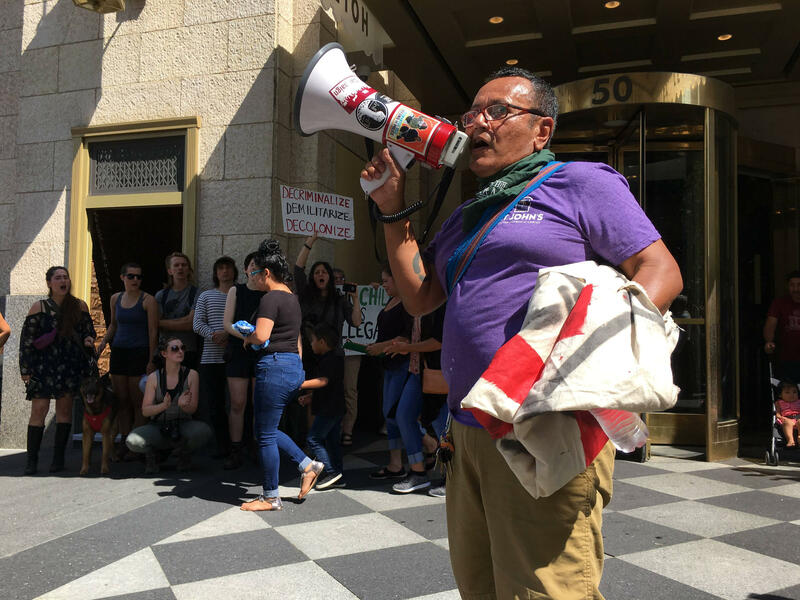 Ruben Herrera of the Columbus Sanctuary Collective says protesters want to abolish ICE, and were galvanized by the Trump administration’s previous policy to separate families at the border. 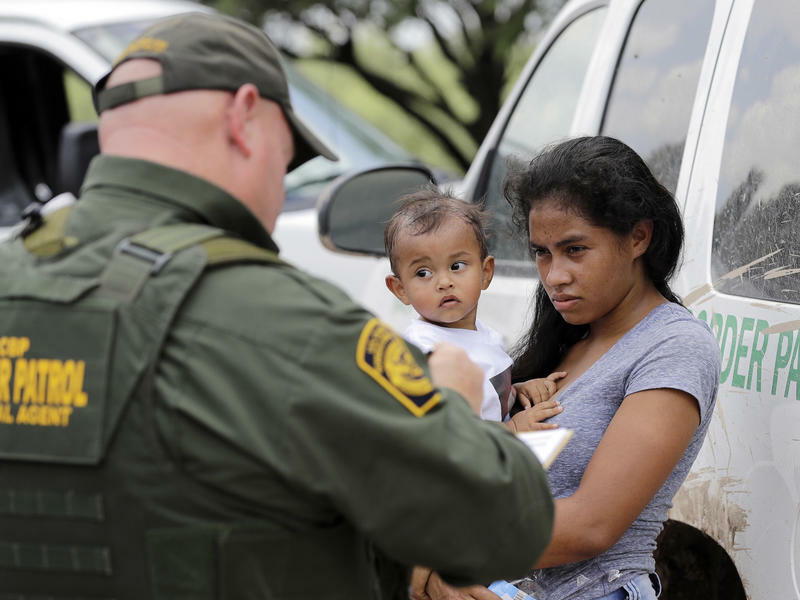 Thousands of children remain detained apart from their parents, after a judge ordered the Trump administration to reunite the families. 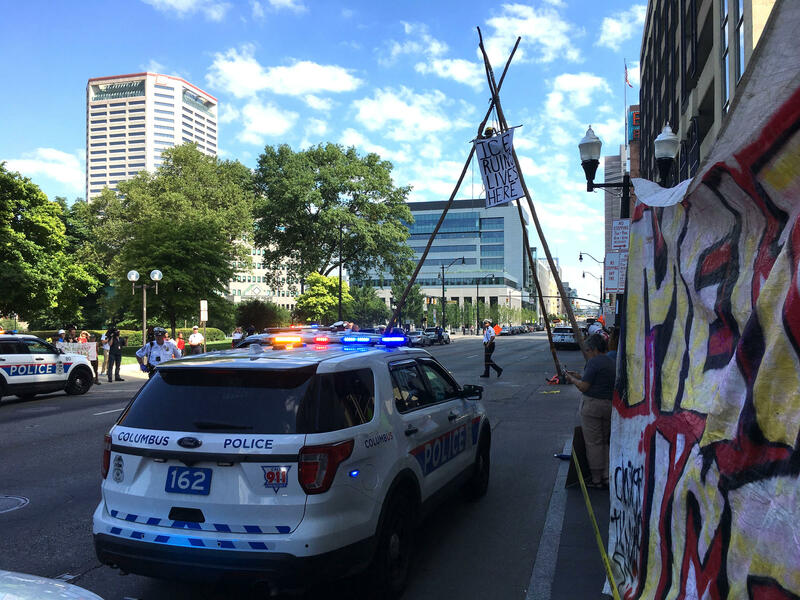 Protesters constructed a two-story-tall tripod in front of ICE offices in downtown Columbus. 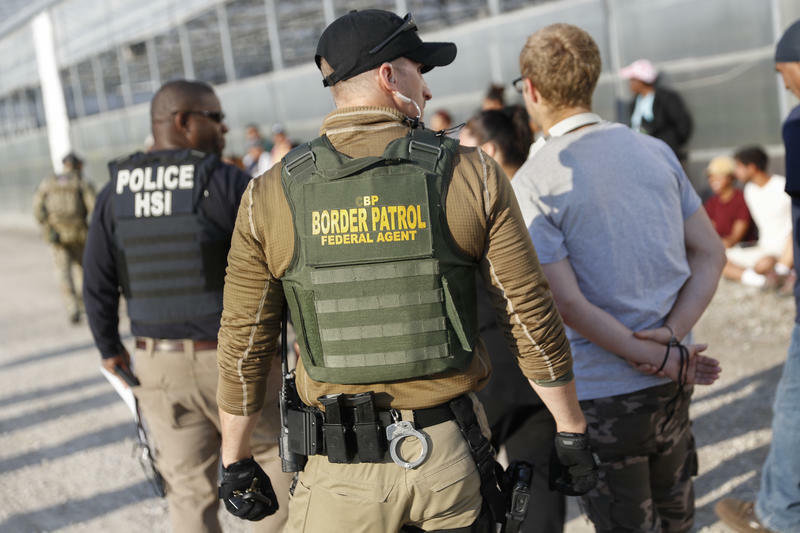 In recent weeks, ICE has undertaken several high-profile workplace raids in Ohio, arresting hundreds of undocumented workers. "We want to make sure that people know that this is not just about immigration rights, it’s about human rights, families being detained and separated and needing to be reunified and ICE needing to be abolished," says Corine Fairbanks from the American Indian Movement. “Kids are being locked up taken away from their parents and it’s not O.K.," Krouse said. 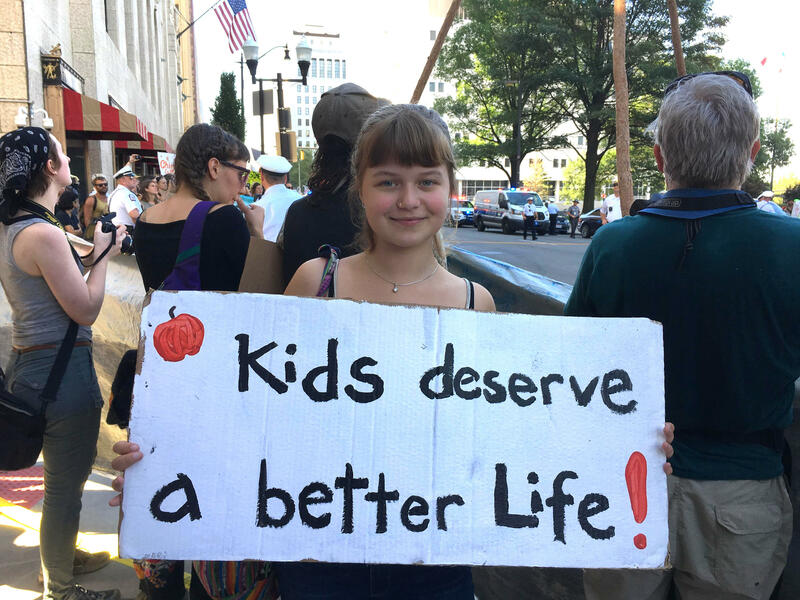 Jasmine Krouse, a 14-year-old youth organizer, at an ICE protest on Monday. Passersby lined the street, looking a little bemused at the odd structure wooden and hand-painted banners. But many sounded sympathetic to the message. Anthony Perez works in a restaurant inside the building, and he came out to the street once he heard the protesters. Columbus Police shut down Front Street for about two hours while they arrested protesters and cleared the street of a large tripod structure. Police shut down Front Street for about two hours before ultimately clearing protesters from the street. 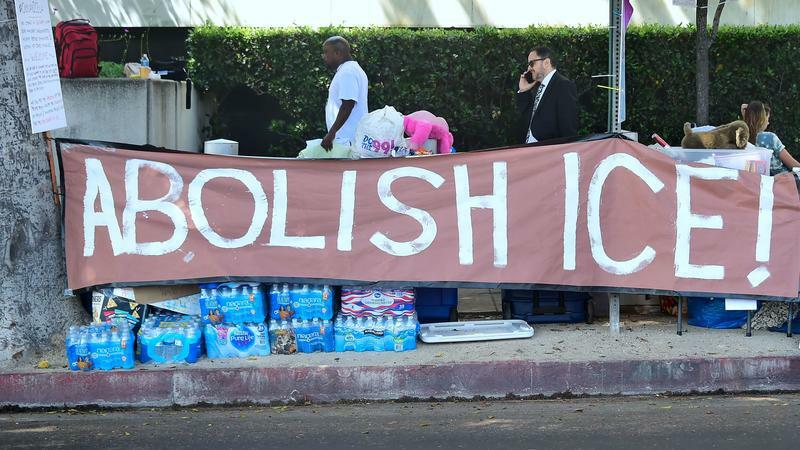 They arrested the protesters bound to the structure as well as another group barricading ICE’s local offices upstairs. City firefighters used a ladder truck and chainsaws to dismantle the wooden structure. As police cleared one sidewalk, a scuffle broke out and they arrested two more demonstrators. Police say charges against protesters include disorderly conduct and failure to comply. 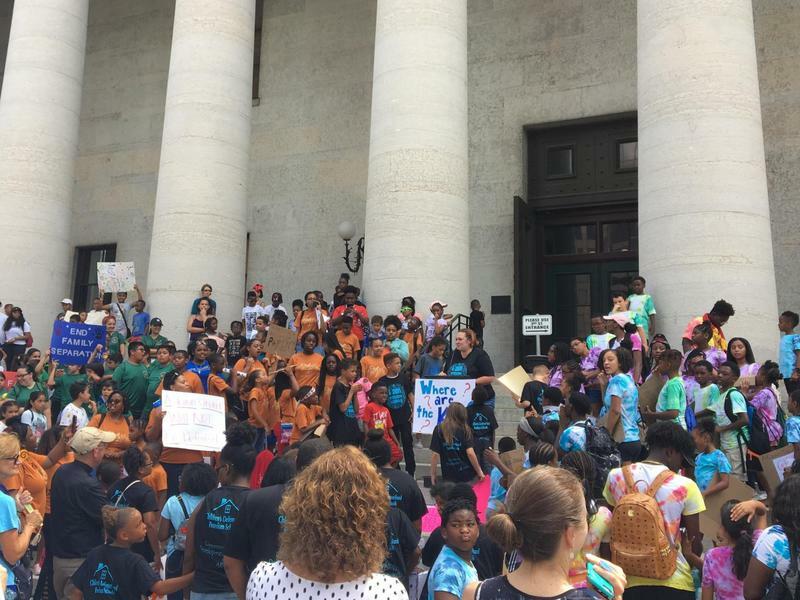 Protests against the Trump administration’s immigration policies continue around the Ohio Statehouse. While the state doesn’t dictate that policy, activists say it has a lot to lose from it. Two of the largest workplace immigration raids yet under the Trump administration, carried out just weeks apart in Ohio, have upended the lives of hundreds of children caught in the middle.